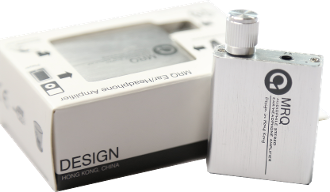 MRQ audiophile headphone amplifier is one of our latest product. Thanks to our self designed +/- 12 Volt circuitry and op-amp, MRQ produces extremely powerful sound despite of its ultra small size. Using re-chargeable lithium battery, MRQ provides you with excellent music enjoyment on the go. Since this item has built-in Lithium battery, we have to use FedEx to deliver this item. Please select Normal Air Mail in shipping option. Please note that price does NOT include any Tax that might imposed during shipment.